Who’s your favorite style icon? I have many, but here are my five favorites: Jane Birkin, Kate Moss, Linda Rodin, Audrey Tatou and Ines de la Fressange. Occasionally I do a channeling post on my blog where I feature someone who inspires me. It’s a fun and challenging way to see if I can pull off their unique styles. 1) They know who they are. 2) They’re confident and/or have an attitude. 3) They know what they like and what works for them. 4) They look comfortable in what they wear 5) They aren’t afraid to take style risks. When is someone too old to be a style icon? NEVER! Great style is ageless. My icons range in age from English actress and model, Millie Bobby Brown, who’s 14-years-old, to Iris Apfel who’s 96. Why do we have style icons? Everyone needs inspiration, even style icons themselves. There is nothing wrong with trying to emulate someone else’s style. Our icons teach us about style. We can take what we like and discard the rest. Who wouldn’t want to channel Jane Birkin? In 1984, she had the iconic Hermès Birkin handbag named after her. At the time she was the “it” girl and the epitome of effortless style. 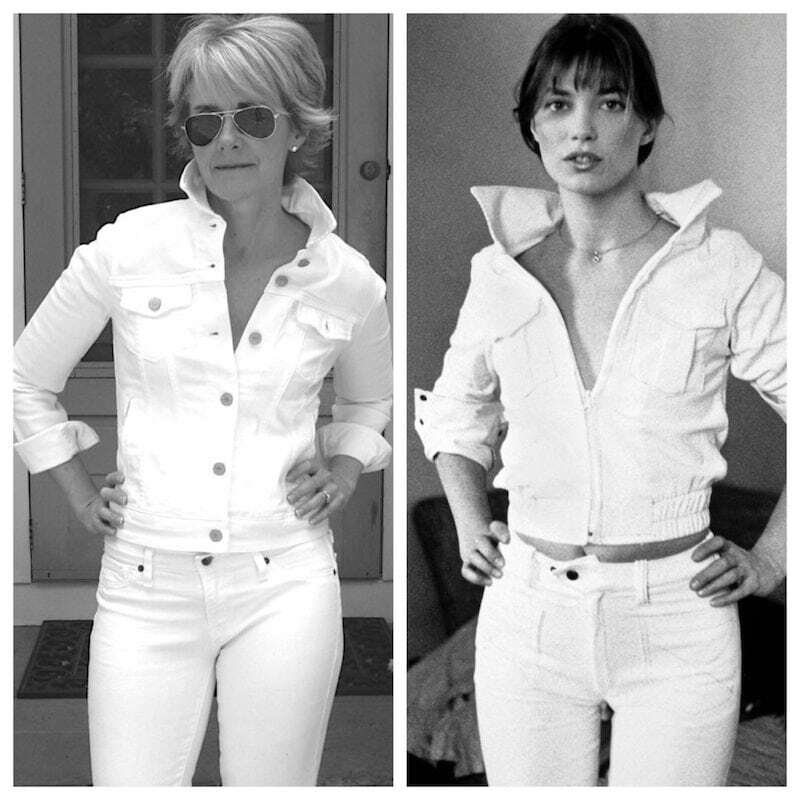 Jane takes us to school on how to look chic with a white denim jean outfit and her always laissez-faire attitude. Kate Moss has been one of my favorites for years, despite the fact that we are years apart in age! Since the 90’s, when she became a supermodel, Kate has made a name for herself as a style icon. She has a knack for mixing vintage with edgy, loves leopard and has the personality to match. Kate’s style is an inspiration to ALL ages. So next time you think twice about wearing something Kate would wear… think again. I adore Linda Rodin. She was a stylist for most of her life. She has her own skincare line called Rodin Olio Lusso and just recently came out with a brand new lipstick line. 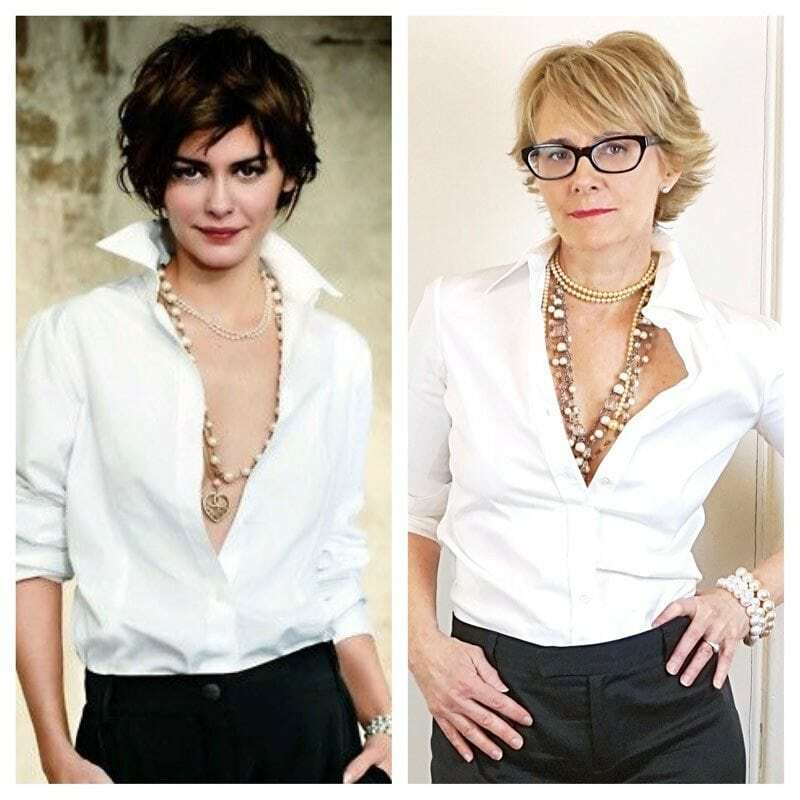 Not only is Linda known for her great style, but she is known for her signature look – red lipstick, tinted glasses, lots of denim and her beautiful grey hair. The most endearing thing about Linda is she loves dogs, and she is rarely seen without her adorable poodle, Winky. I have always admired Audrey Tautou for her style and her acting. Her French style is classic, alluring and graceful. She favors Chanel flats, red lips, and white blouses. If you haven’t seen her in the movie, Coco Before Chanel, you must. I’ve watched it many times. 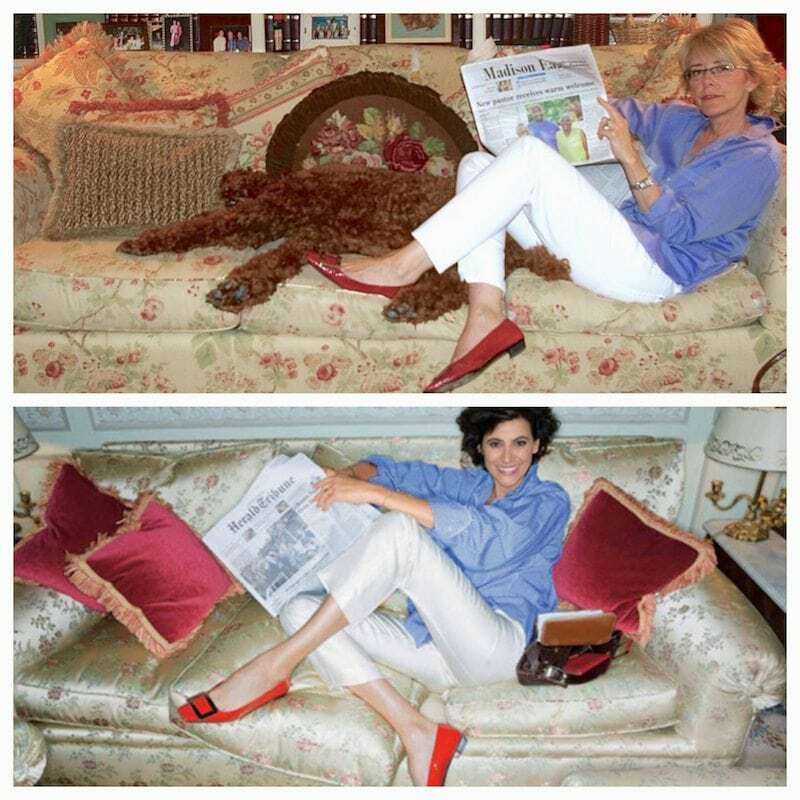 Ines de la Fressange is well known for her French fashion sense. She was a very successful runway model, Karl Lagerfeld’s muse and the face of Chanel. She is the epitome of elegant effortless style, and three years ago she opened her own boutique in Paris. For those of you interested in casual French style, Ines’ book, “Parisian Chic,” will not disappoint. My copy is dog-eared, I’ve referred to it so much. Really enjoyed this post. These women are fabulous icons for a reason! You look fabulous too Cherie. Thank you Kimberly! They really are fabulous and so inspiring. Hahaha!, thank you Laureen, so glad you like the post! You are a doll Hilda, thank you for your very kind words. Love that song! That means so much to me that I have inspired you, thank you Donna. YOUR SOFA is SOOOO MUCH BETTER than INES!!!!!!!! This was FUN…………..YOU did a great JOB! Did you know ESTEE LAUDER bought OLIO LUSSO?Think I told you I spoke with Linda once way back she had a small write up in Voque with a number to call and it was her HOUSE!WE HAD A LOVELY CHAT!!!!!!!! I used up two bottles than went on to something else as we tend to do………….It was GOOD STUFF! I remember you telling me that, how lucky are you. The closest I’ve gotten to Linda is my daughter sees her all the time out and about in Manhattan with Winky. Thank you my Contessa! Cherie, this was so much fun! I adore Linda Rodin and she’s one of my style icons too. I fell down the rabbit hole just yesterday, looking at images of her and watching youtube interviews. Oh and Kate Moss too! So enjoyed this! I fall down the rabbit hole all the time doing the exact same things Jill. You can really get lost viewing all their delicious stuff. So glad you enjoyed the post! Well done, Cherie! I love Ines’ book Parisian Chic, too. I wish there were more style tomes that I could relate to. Ever thought of publishing a style guide? Oh my, no I haven’t, but what a fun idea! I agree with you about the fact that there are a lot out there, but not too many like Ines’! Thank you!